Criminal lawyer David Rail (Huw Higginson) was supposed to be meeting his wife at their lakeside holiday home to celebrate their wedding anniversary. Instead he wakes up in a sparsely furnished hospital room with a locked door. The last thing he remembers was working late on a brief at his office. So what happened? And how did he get here? A psychologist called Alice (Jeanette Cronin) explains that he is displaying symptoms of a condition called anterograde amnesia, whereby he is unable to retain new memories, though his long-term memory is fine. (Guy Pearce’s character had the same condition in the film Memento). Every 15 minutes or so, he forgets what has just happened, so as Alice works with him, they must keep starting again. As they retrace David’s steps, teasing out fresh information, Australian playwright Aidan Fennessy weaves in new clues leading to a dark secret. To reveal any more of the plot of The House on the Lake would be a crime. Fennessy’s taut two-hander is a gripping psychological thriller with a twisting kaleidoscope of scenes that spin around themes of lies and truth-telling as well as a trust-betrayal-revenge theory propounded by David. The fiercely articulate David, who is a great believer in logic, also (rather cockily) throws in some Edgar Allan Poe. Fennessy’s tight script is cleverly written and feels well-researched, with the legal and psychological elements ringing true. 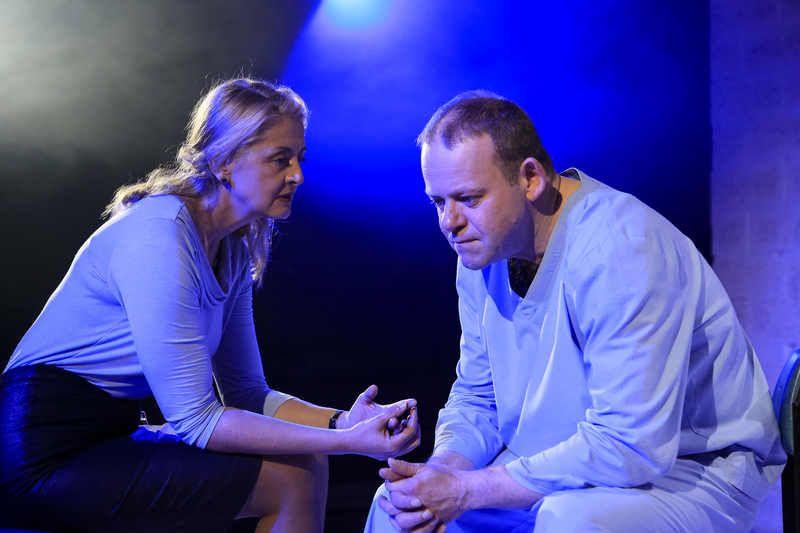 Kim Hardwick directs an absorbing production for Griffin Theatre Company, simply but eloquently staged on Stephen Curtis’s stark, suitably clinical, anonymous set. 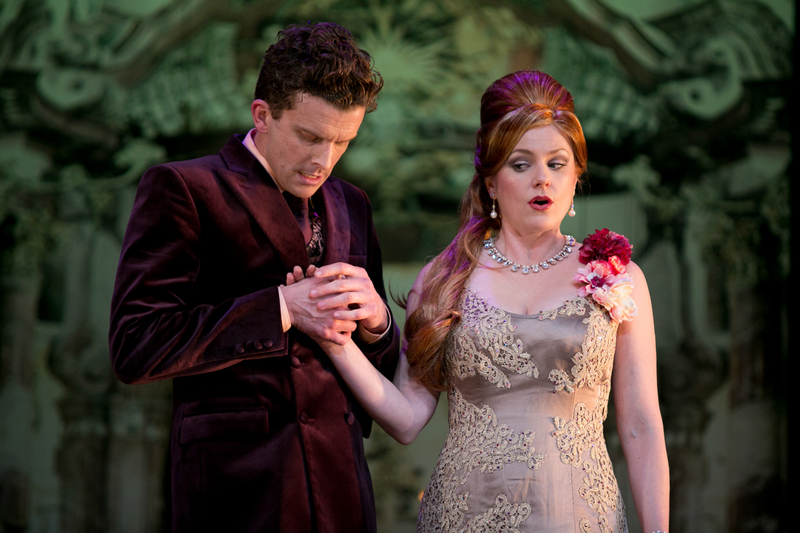 Martin Kinnane’s lighting and Kelly Ryall’s sound both make strong contributions to an excellent production. Higginson is superb as David, giving a subtly shifting performance as more gradually comes to light and his condition slowly changes. Cronin offers strong support playing Alice with a brusque, inscrutable professionalism. Initially her performance feels very cold and abrupt but as the play progresses there are hints of something more. The foyer was buzzing afterwards as people unpicked the play. Some had twigged early; others were surprised. But even if you had your suspicions about where the play was going, it didn’t spoil the experience. Running 90-minutes, The House on the Lake is an intriguing puzzle of a play, brilliantly staged and hugely entertaining. 2015 marks Bell Shakespeare’s 25th anniversary so it’s a shame that their first production of the year is a disappointment. 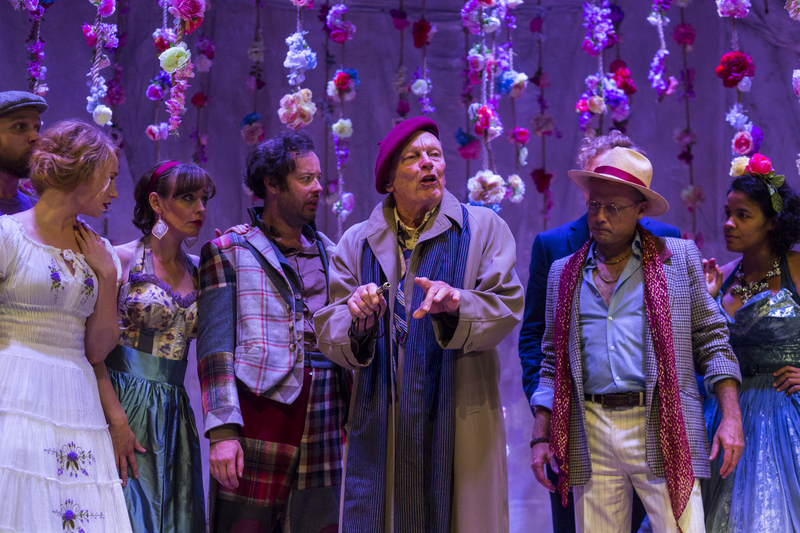 Set in the Forest of Arden, As You Like It is a delightful comedy that pokes gleeful fun at romantic love and supposedly idyllic rustic life. 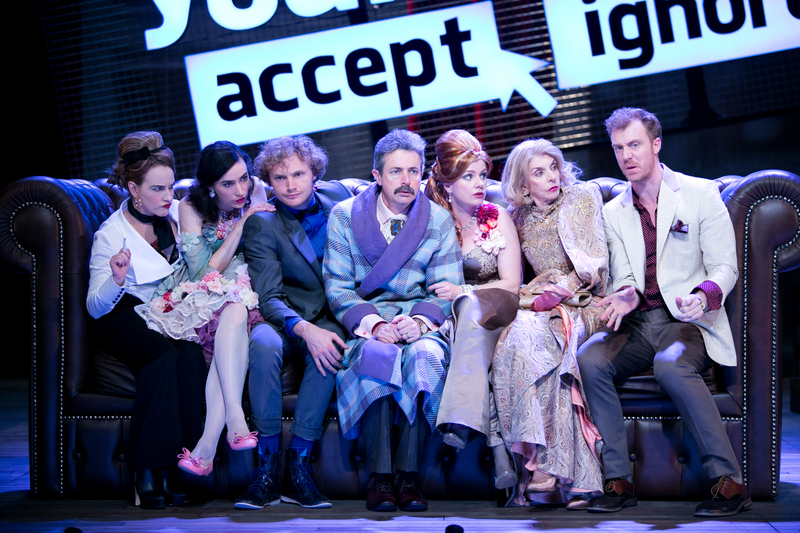 It is full of humour – but hardly any of it lands in this production directed by Peter Evans. The laughs on opening night came mainly from various bits of stage business rather than the comedy in the play itself. Few of the touching or serious moments hit home either. Michael Hankin’s set features paper flowers on hanging ropes backed by a canvas drape, along with a costume basket and a large ladder, which looks as if it has been left behind by the technical crew (a reference presumably to “all the world’s a stage”). The staging doesn’t quite capture the romantic nature of the forest where people are changed and relationships healed, and Evans doesn’t manage to create any real sense of a world within it, or outside it. The production instead seems to be a mish-mash with no cohesive visual or performance style, and little unifying vision. Kelly Ryall’s songs don’t feel as though they emerge organically from the production and Kate Aubrey-Dunn’s costumes, inspired by the 1930s, 50s and 60s, often sit oddly. Orlando appears on stage looking like an insurance salesman in neatly pressed trousers, shirt and brogues, while complaining about his brother keeping him “rustically at home” and having to eat “with his hinds”. Celia sports an elegant coat with fur trim and diamante buttons when she’s supposed to be disguised as a poor country maid. Worse, Rosalind’s disguise as the boy Ganymede consists of tight pants and fitted waistcoat, which actually emphasise her feminine curves. 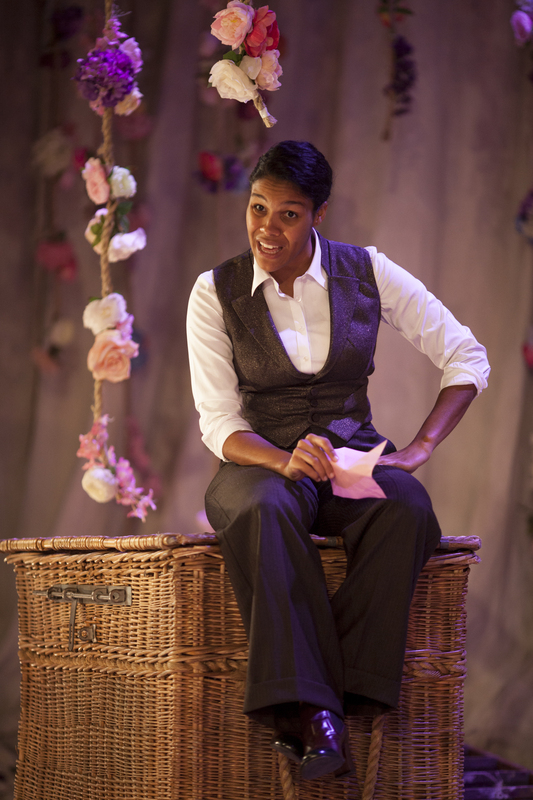 Rosalind is one of Shakespeare’s great female characters: strong, clever, witty and resourceful. Banished from her uncle’s court, she comes up with a plan to flee to the forest disguised as the young man Ganymede with her cousin Celia pretending to be Ganymede’s sister. She then hatches a scheme to have Orlando (who has fallen for her, and who has also had to flee to the forest) use Ganymede as a way to practice wooing Rosalind. Evans’ direction, however, robs the role of nuance and playfulness. Zahra Newman gives us no discernible difference between her Rosalind and Ganymede. All the gender-bending layers and much of the fun are therefore lost in the scenes between Orlando and Ganymede, when Orlando finds himself attracted to the youth. In Shakespeare’s day, with the all-male casts, the exploration of sexual ambiguity would have been further compounded by having a boy play a girl disguised as a boy. We get none of that here. Aside from that, Newman handles the language well and after a slightly tentative start is a lively presence. Charlie Garber looks awkward as Orlando, giving a performance full of the jittery, emotionally detached, comic mannerisms we have seen from him so often before and misses Orlando’s honourable, romantic, dashing and tender sides. Scenes such as Orlando comforting his exhausted, elderly manservant Adam as he goes off to find him food aren’t moving, as they usually are. And there is little chemistry between Garber and Newman. Evans has chosen not to portray the rustics as country bumpkins. But the decision to have them speak pretty much like the courtiers, without any kind of rural accent, diminishes the divide between the two worlds, and again much of the comedy is lost despite the cast’s best efforts. As the melancholy Jaques, John Bell delivers a fresh and poignant “Seven Ages of Man” speech while, in one of the standout performances, Kelly Paterniti’s effervescent Celia has welcome heart and depth. Tony Taylor brings a droll charm to the role of Adam and Dorje Swallow impresses as Oliver. Evans has clearly tried to avoid the tried-and-true tropes of this popular and regularly staged play but in putting them to one side, much of what makes it so delightfully entertaining has been lost. Right from the get-go, Justine Fleming’s contemporary adaptation of Molière’s Tartuffe has the audience chortling in this new Bell Shakespeare production. As with his adaptation for Bell’s 2012 production of Molière’s The School for Wives, Fleming combines colourful, irreverent colloquialism with rhyming couplets. Phrases such as “bunch of losers”, “shut your gob” and “a piddle short of a piss” had the delighted audience in stitches. At the same time, it’s an extremely clever adaptation that faithfully captures the spirit of Molière’s satire about religious hypocrisy and gullibility and tells the story with great élan and clarity. Locating it in the present day, the themes certainly feel as relevant as ever. Rich, successful and married to a gorgeous, younger second wife Elmire (Helen Dallimore), Orgon (Sean O’Shea) is looking for spiritual meaning in his life. Sensing that he’s ripe for the picking, the devious, duplicitous Tartuffe (Leon Ford) schemes to take him to the cleaners. Tartuffe also has his eye on Elmire, while Orgon wants him to marry his daughter Mariane (Geraldine Hakewill). No matter that she is already promised to Valère (Tom Hobbs). Orgon and his mother (Jennifer Hagan) may be taken in, but the rest of the family see straight through Tartuffe’s fraud and plot to trick him into revealing his true nature. Peter Evans directs a rollicking, extremely funny production on a set by Anna Cordingley with oversized furniture that not only matches the excess of all that unfolds but also suggests the childishness of their behaviour. Besides a massive sofa, there’s an off-kilter grandfather clock and a giant closet with an ever-changing interior. In the second act a sign descends inviting you, in Facebook fashion, to “accept” or “ignore” a request to befriend Jesus. Cordingley’s colourful costumes are also amusing, wittily combining styles and eras, while Kelly Ryall’s jaunty, synthesised versions of baroque music work a treat. In the original 1664 comedy, tragedy is averted at the last minute with an intervention from the King. Here, Fleming puts his own twist on the ending with Poetic Justice saving the day, while tipping a nod to Molière being the French Shakespeare. The cast all bring an enormous vigour to the roles. Kate Mulvany is a knockout as the outspoken, sassy, exasperated maid Dorine. Tottering around on vertiginous heels, her effortless command of the language and comedy is deliciously spot-on. Ford is smoothly, smarmily sanctimonious as Tartuffe one minute, then breaks out with hilarious abandon when he thinks no one is watching. His pelvic thrusting move across the stage to Elmire is hilarious while his amorous advance on her, using her fishnets and high heels, is one of the funniest things I’ve seen on stage in ages. O’Shea is also very funny as the well-meaning but bullish, deluded Orgon. I’m not sure that in this day and age Mariane needed to be quite such a ditzy bimbo but Hakewill plays it to the hilt. The lovers’ tiff between her and Valère is a hoot, while Hobbs has fun and games breaking the fourth wall. In fact, there are terrific performances all round from Charlie Garber as Orgon’s hot-headed son Damis, Robert Jago as Orgon’s level-headed, clear-sighted brother-in-law Cléante, Hagan as the haughty, disapproving Madame Pernelle, Russell Smith as Monsieur Loyal and Scott Witt as the bumbling servant (among other roles). All in all, the production is a delight, full of inspired comic touches from the funny little bounce as various characters flop onto the sofa to Dorine stashing a half-smoked cigarette in her bra. Too much fun. Highly recommended.